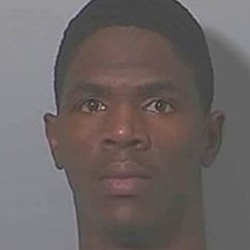 James Marcus Brown, 25, died from a gunshot wound to the chest after a North Las Vegas foot chase on Saturday morning, August 29, 2015 the coroner's office said Sunday. Metro was called at 3:17 a.m. about a theft at the Siegel Slots and Suites, located at 5011 E. Craig Rd., near the Nellis Boulevard intersection, according to dispatch logs. Witness descriptions led police to pull over a car with three people in it on East Cheyenne Avenue, on the Interstate 15 overpass, a short time later, said Metro Capt. Matt McCarthy. Two people in the car were arrested without incident, but Brown, who Metro said was armed, ran into a desert lot. An officer chased Brown and tried to use a stun gun on him when he didn't follow several orders to drop the weapon, McCarthy said. The stun gun was "ineffective." The officer, "fearing for his life," fired multiple rounds from his service weapon when Brown turned toward the officer with the gun still in his hand, police said.